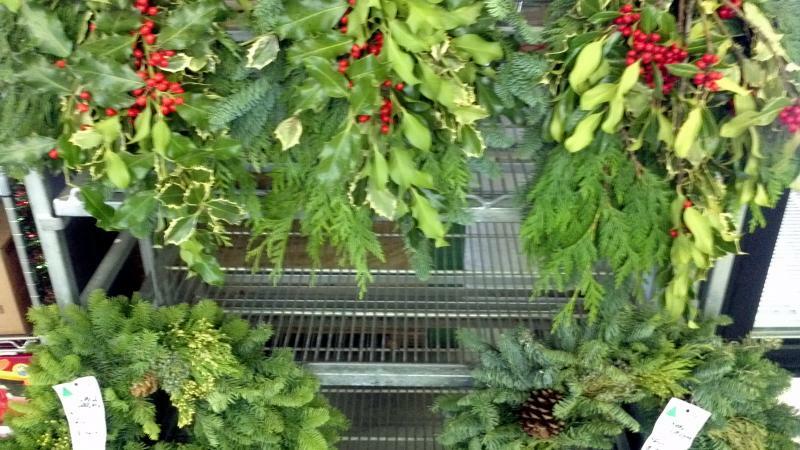 For most, it's hard to avoid the pressures of the holiday season that make us feel the need to decorate. Well we can help you with getting the right tree for your house, with the least possible hassle. 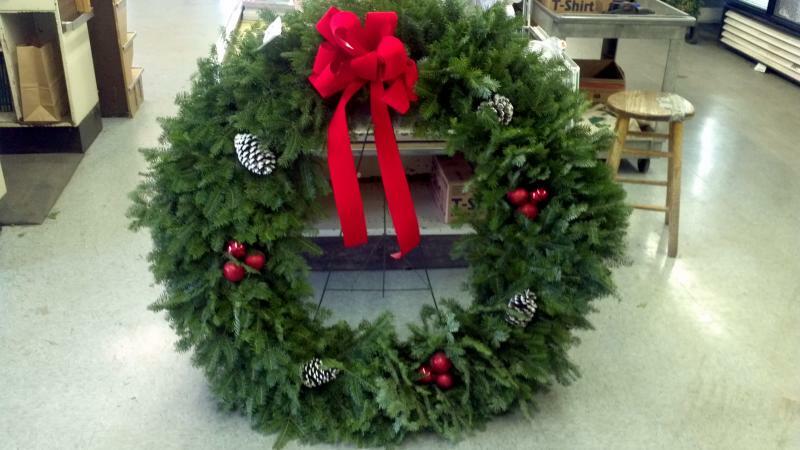 At our store, we offer as many as eleven different types of Christmas Trees, stands to put them on, wreaths and more. We are right in town, so there won't be any long drive to a cutting farm and we display as many trees as possible standing up. Come see us beginning the day after Thanksgiving to find the right tree for you and your family. It will be a good experience and won't take a lot of time from your busy holiday season. We want to make sure that you go home, not only with the right tree, but with good spirits, and for that reason we offer full service with your tree. When you come in, you don't have to come prepared. You don't need the right kind of car or any rope. You don't even have to wear gloves as we will handle the trees and load them on whatever car you have. Once you have chosen the tree that you like-- we are happy to move them around or give them a spin to show them off for you, we will ask you if you need a fresh cut. Fresh cutting a tree means giving it a one inch cut from the base to open up its drinking paths. Should you be planning on setting the tree up on a later date, you might elect to not have the cut done, at which time we will remind you that it needs to be done before putting in the stand. You also have the option of letting us cut it and leaving it in a bucket of water outside until you're ready to put it in the house. Now the tree is cut and we will shuttle it inside to the baler. Here we pull your tree through a rig with 23" netting around it, effectively holding your tree to a more comfortable size. This makes it easier for us to load it or tie it on your car and it makes it easier for you to bring through the door at home. Once baled, we will ask which vehicle you are driving so we can load it up. If you have a pick up truck, we will smile and throw it in the back (this is the easiest loading method after all). If you have an SUV or wagon with a roof rack, we will get some twine and tie it down. If you have a two door car with a full trunk and a dog in the back, we will find a way to tie it on top or ride shotgun, or whatever you decide you want done with it. In the end, you will have come to our store for a tree and not even had to touch the tree before bringing it into your house. That is what we call a full service operation. Balsam Fir-- The Balsam is sought after because of its mint-like fragrance and soft feel. It has short needles and appears much the same as a Fraser Fir. Canaan Fir-- Very similar to a Balsam, these have a more spaced branching that gives them a slightly different look. Poor needle retention, but soft feel. Concolor Fir-- A long needled fir, the Concolor has a strong, tangerine-like scent. They are very soft touch trees and have great needle retention. Douglas Fir-- These look like a traditional pine christmas tree, but have a soft feel and citrus-like scent. They have good needle retention but less sturdy branches than other firs. They are painted to give them a nice green color instead of their natural dormant color of pale greenish-yellow. Fraser Fir-- The most popular fir tree, these have two-toned needles, soft feel and excellent needle retention. They have an upwards habit that also makes them sturdy for decorating. Grand Fir-- The squat shape and long needles make this a unique selection. They have a very soft feel, strong aroma and very good needle retention. Noble Fir-- The only non-Michigan tree, these have a flat layered branch, pungent aroma and soft feel. They are good at holding their needles, but are cut early and shipped from Oregon, so they are pricy and will dry out sooner than other firs. A traditional western tree that is well worth the investment. Scotch Pine-- One of the most common trees sold at Christmas, these have the traditional shape and color that many look for, but they are painted to give them that color. They have a stiff feel and good needle retention. The Scotch Pine is also the most economical tree for consumers. White Pine-- This pine is painted with dark green and has a very soft feel. They are quite flimsy so cannot take a lot of excessive decorating. Black Hills Spruce-- A sturdy, short needled tree, these are easy to decorate and not as sharp as the blue spruce. The Black Hills Spruce is painted to give it a rich green hue. Blue Spruce-- These are popular for the strong branches and appealing shape. They have very sharp needles and a pungent smell. Their needle retention is questionable. Trees tend to lose needles when they dry out in the house, here is a list showing the best (1) to worst (11) in this category.